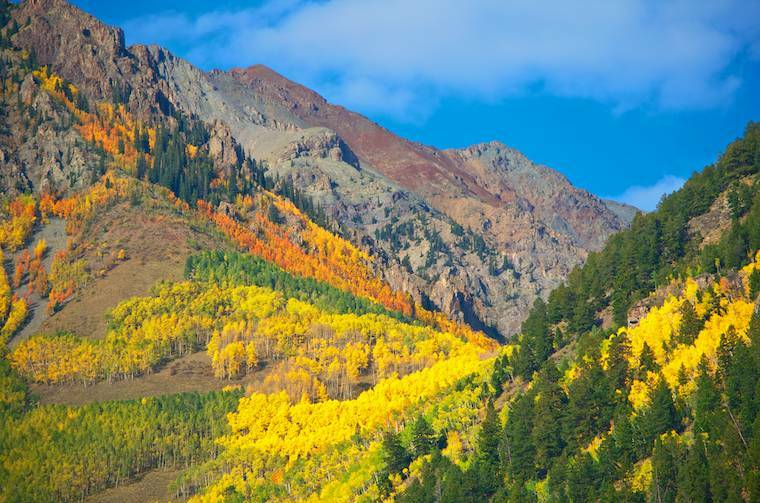 Ridgway, CO – Peak fall foliage on the Dallas Divide – WOW!! Late September, 2012 – Over the summer, while I busied myself converting our website to WordPress, Mark delved into a passionate study of photography. Pouring over books and websites for days at a stretch, his photography skills soared. Mine improved a bit too, since he had a tendency to read every favorite passage (which was pretty much everything) out loud. 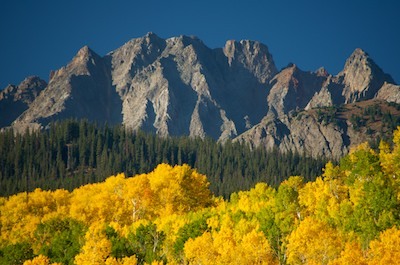 In his studies he found a photographer who was offering a one day Fall Foliage Landscape workshop in Ridgway, Colorado, at the end of September. We signed up immediately. For over a month, getting to Ridgway by September 22nd shaped our travels. 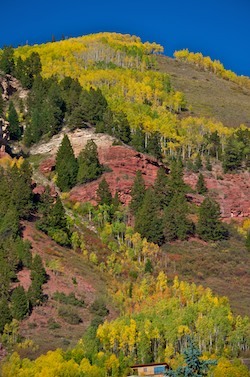 We left Fruita, Colorado, behind, and trucked down to Ridgway a few days before the workshop so we could begin the hunt for a spot to boondock. 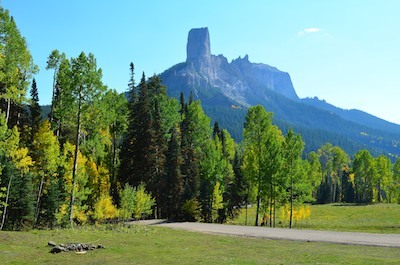 We drove the dirt road that goes up and over Owl Creek Pass, and were thrilled to find one absolutely jaw-dropping vista after another. 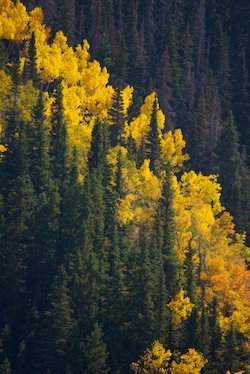 The aspens were at the peak of color and the air was crisp and cool. Our camera shutters clicked like mad all day. We found an ideal boondocking spot, but there was no way we could ever get the trailer to it on that skinny, steep dirt road. After admiring the spot for a while — and imagining how we’d set up camp and orient the rig to maximize the view — a couple showed up. The husband walked over to me. “True Grit?” I said dumbly. “Is that a movie?” Mark smirked and the guy raised an eyebrow. We drove on and Mark filled me in on John Wayne. I confess that I didn’t know a whole lot about his movies, so Mark had a lot to say since he had been a big fan as a kid. Up around the corner we came to another gorgeous clearing in the woods with a peek-out view of the colorful mountains. That guy we’d just talked to and his wife pulled up at the same time. “This is where John Wayne got drunk!” He said, plopping down on a rock and posing as if taking a swig. 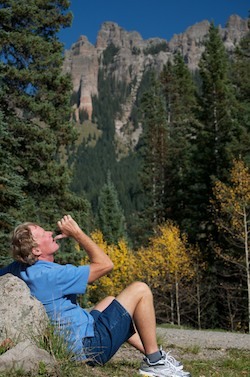 His wife took a few photos of him, lining up the mountains in the background. Then he hopped up and motioned for Mark to sit down and for me to get a similar picture. I had no idea how the shot was lined up in the movie, but I took a guess while Mark pretended to tip back a bottle. 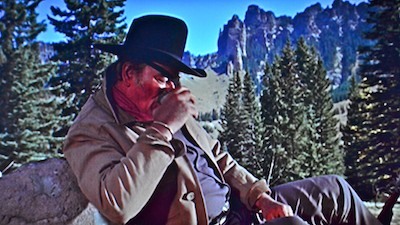 A few days later, we located a copy of the movie and waited eagerly for the drunk scene on the mountain — and then there it was! We had gotten the shot pretty darn close! This spot always has photographers in it. The next day we met up with our workshop instructor, Nasim Mansurov of PhotographyLife.com, and we piled into his car along with some other students to scout out locations for the workshop the next day. What fun! 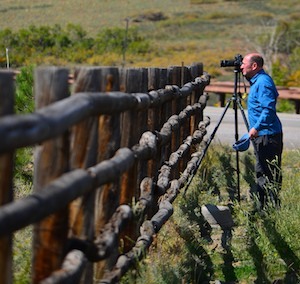 We started at the fence where we would take our morning sunrise shot. This is a very popular place for photographers, and sure enough a few were there with cameras set up on tripods. 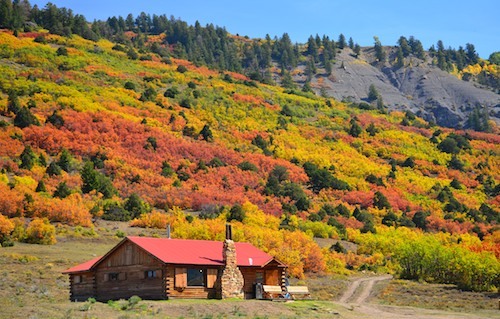 We drove out on Dallas Creek Road where the colors ran from yellow to vivid reds and oranges. 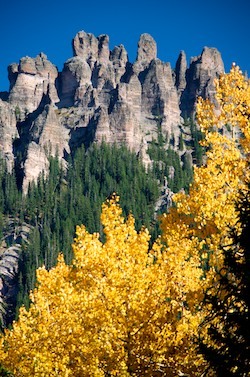 One of the key pieces of equipment for this workshop was a polarizing filter that would enhance the fall colors. I had inadvertently left the one for my wide angle lens on our boat back in March. Arrghh!! However, I did have the one for my 55-300 mm lens. So here I was looking at these wide open, vast, colorful panoramas with a telephoto zoom lens. Oh well! I focused on finding patterns in the landscape. Mark tried some wonderful artistic techniques he’d read about, and got some cool effects. A coyote poses for an instant. 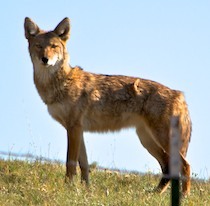 On our way down out of the mountains on Last Dollar Road we passed a coyote who posed just long enough for us all to hang our cameras out the car window and take some shots. 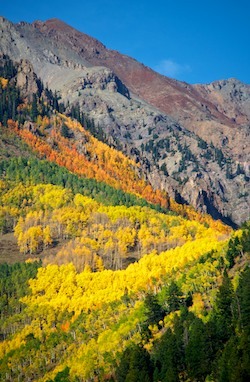 Coming into Telluride, the afternoon sun lit the entire town in brilliant colors. 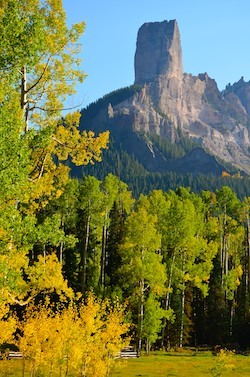 We had fallen in love with Telluride years ago when we visited in a car with a tent. 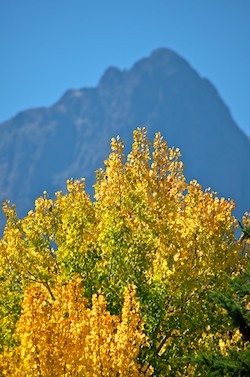 But that had been in July when the town’s colors were grey and green from the mountains and trees. 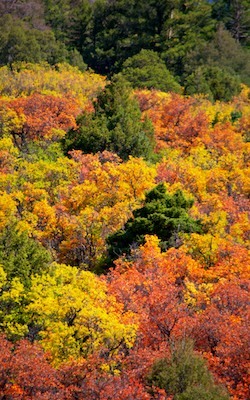 Now it was a kaleidoscope of colors and was truly sensational. We were both ecstatic to find ourselves surrounded by such beauty. 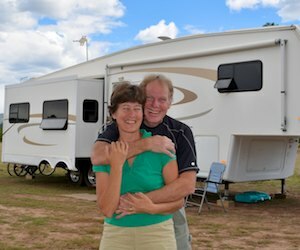 Colorado is challenging for our style of RVing, since the roads are steep and narrow and there are rules and regulations preventing RVs from parking just about anywhere. So we had decided against it as a destination — until this workshop. Sure enough, we never did find a place to boondock. After four months of never paying a dime to camp, we suddenly found ourselves paying $29 a night for a site at Ridgway State Park. Ouch, that hurt!! But the thrill of taking photos in this incredible location was worth ever penny. 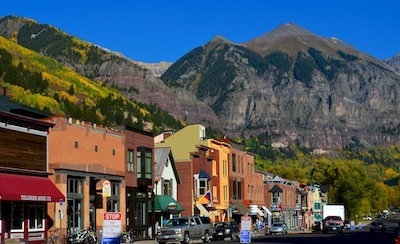 Telluride – one of America’s prettiest towns! That night we oohed and ahhed over each other’s pictures as we downloaded them on our computers. We could hardly wait for the workshop to begin on the Dallas Divide the next morning with the sunrise shot at oh-dark-thirty. 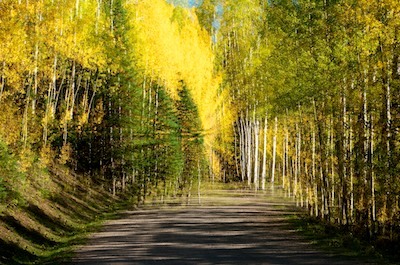 This entry was posted in Colorado and tagged Colorado, Colorado Fall Foliage, Fall Foliage, Travel, USA, WP Travel by Roads Less Traveled. Bookmark the permalink.